Why does Buffalo have so many beautiful trees? 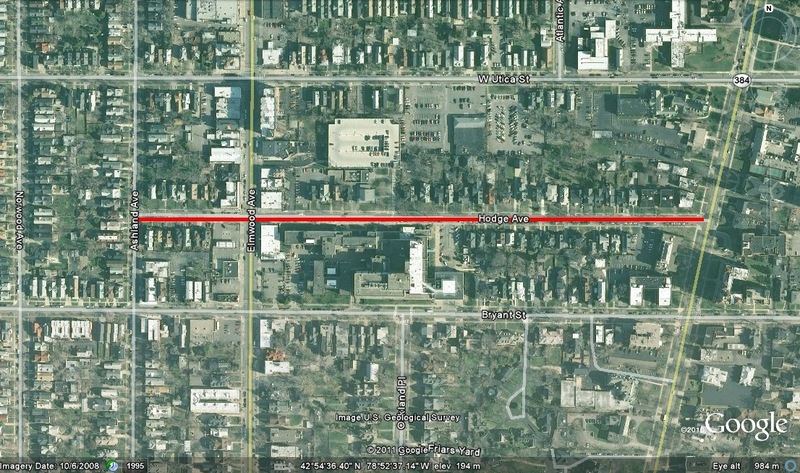 Hodge Avenue runs approximately a half-mile between Delaware Avenue and Ashland Avenue. 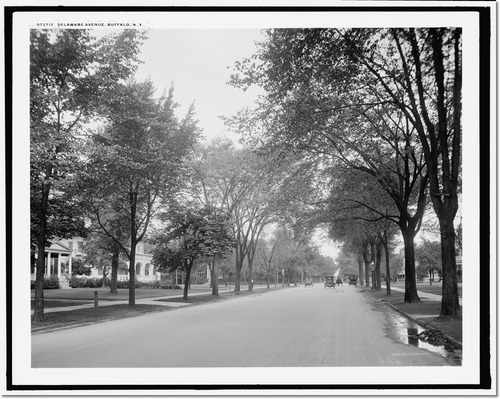 Like many of the streets in the Elmwood Village, Hodge Street is lined with beautiful homes and large stately trees. It’s hard to imagine the City of Buffalo without it’s street trees. Although, the trees might not even be there if it wasn’t for the Hodge family…. The Street is named for William Hodge. William came to Buffalo in 1805. He owned the first nursery in what was then known as the Western Frontier. He also had an orchard of apple trees. William Hodge’s first house in Buffalo was at the Cold Spring at Main and Utica. His house was a popular stopping point for travellors going from Buffalo to Williamsville (remember, at the time, it was still a dirt road through the forest, not a 15 minute car ride down the Kensington Expressway). In 1811, William built the first brick house in Buffalo, using bricks he manufactured on his property. His farm ran from the Cold Spring to what is now Richmond and from Bryant to Utica. On the property, William and his son, William the 2nd, killed wolves. Wolves brought a bounty of $30 a piece at this time. There were also deer, fox, and carrier pigeons on the property. During the War of 1812, his house was burned, along with the rest of the Village of Buffalo. The Hodge farm was left in a more pristine condition that the other farms int he area, b/c Mr. Hodge didn’t like to farm. He’d barter furniture and coffins carved from the trees on his property in exchange for produce from the farms. In 1825, William and his wife were in the canal boat with Governor Dewitt Clinton during the historic first trip down the Erie Canal. During that trip, Mr. Hodge brought some elm trees from Long Island for his nursery. With his son, William Hodge was instrumental in bringing the Elm trees to the the City. They were also important force for fruit-growing across Western New York. After the trip down the Erie Canal, the Hodge nursery became well known. The City would buy their trees from the Hodges, and they’d convince the city to buy Elm trees, as they are graceful and enduring trees. The City of Buffalo became known to some as the City of Trees. William the 2nd laid out Hodge Avenue and Delaware Avenue north of North Street, and built many of the houses on the street which now bears his name. “Named for William Hodge”. Courier Express, Jul 3 1938, sec 7 p 8. I used to live on Monroe St between Sycamore/Brown Streets, trees were everywhere. Even the Fruitbelt used to have lovely trees. The not too long ago Elm disease hit everywhere. Irv Weinsten on the News one night. He said pin a diaper around a tree trunk folded face up, those bugs climbing up into the pocket can’t get out when tightened a bit. It worked. You just take the diaper off, dispose it. If we had planted different types of trees side by side as you see naturally in the forest, Dutch Elm bugs wouldn’t crawl next to each other. I miss the trees of Buffalo. I lived on Hodge just West of Elmwood for many years. What a great bit of information to retain along with my already pleasant memories of this street. Thank you!